Sam Matreja (left), Manager of Strategic Accounts and Louis Pasquarello (right), Clinical Resource Manager receive the Fast 50 award from Tom Angell, Principal from Rothstein Kass. Brian Tom, Regional Sales Manager of Oracle Corporation is on the right side. Princeton Junction, NJ (November 17, 2008) - NJBIZ, New Jersey?? leading statewide business newspaper, announced and honored NewAgeSys, Inc., along with the other honorees that have made significant contributions to the growth, strength and success of New Jersey during the New Jersey?? Fifty Fastest Growing Companies award ceremony held at The Palace in Somerset Park on Monday, November 17, 2008. NewAgeSys, Inc. is proud to announce its rank of # 39 on this year?? list. The New Jersey?? Finest Fifty Fastest Growing Companies event is a program of NJBIZ and was presented by Rothstein Kass. Major sponsors of this event were Oracle, Lowenstein Sandler PC and The PNC Financial Services Group. In order to be eligible for nomination, companies needed to show revenue of at least $500,000 in each of the fiscal years ending 2005, 2006, and 2007 and show revenue growth in 2007, as compared to 2005 (a three year period). Eligible companies were to be for-profit entities headquartered in New Jersey. Presenting sponsor, Rothstein Kass, calculated the nominations and then ranked the companies according to revenue growth over the three-year period of 2005-2007. Both dollar and percentage increases were taken into consideration. This ranking formula led to recognition of the 2008 New Jersey?? Fifty Fastest Growing Companies consisting of both large and small companies. 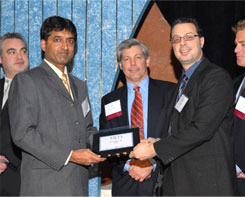 In addition to the awards ceremony on November 17, 2008 the Top Fifty Fastest Growing Companies are profiled in a special supplement to the November 24, 2008 issue of NJBIZ. The complete list of honorees is published in ranked order, along with information on each company?? financial growth. NewAgeSys, Inc., founded in 1994, has become a leading provider of Technical and Pharmaceutical consulting services to Fortune 500 companies. Headquartered in Princeton Junction, New Jersey, NewAgeSys is operating nationwide with services performed onsite, offsite and offshore. NewAgeSys is known for solving business problems with cost effective and superior quality solutions that exceed customer's expectations.